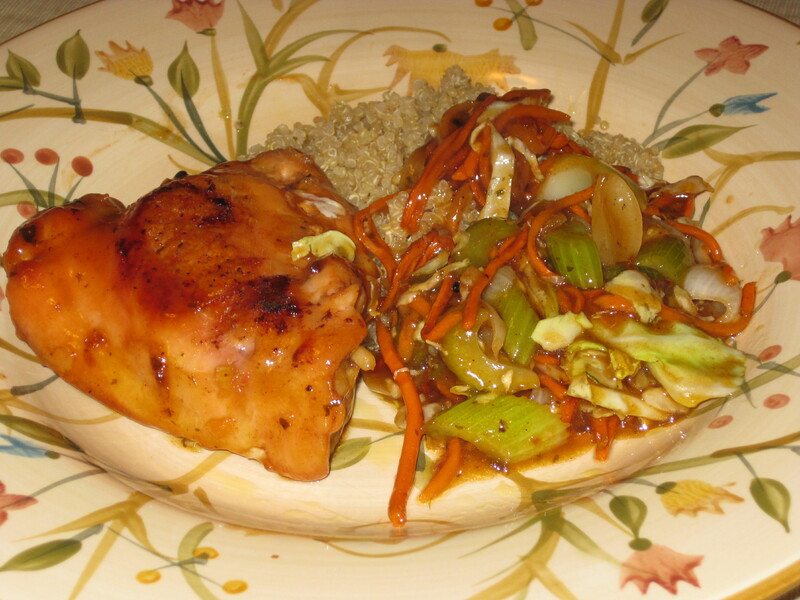 Orange Ginger Chicken, Quinoa, Stir Fry Veggies. See? I CAN cook healthy food! I was craving chicken over rice with some type of sauce, but couldn’t quite put my finger on the type of sauce I wanted. Quinoa sounded good too, and it’s so versatile I knew I could make a pot to use for several meals. So I grabbed a bottle of sauce from the pantry, pulled out some fresh ginger, garlic, onions, celery, carrots & cabbage, and cooked up some deliciousness! Normally I season quinoa when I cook it, but this time I wanted to use it for both sweet and savory dishes, so I cooked it up plain. I let the sauce from the chicken and veggies season it. Later this week I’ll make a sweeter version by adding almond milk, fruit and warm spices. If you’re not familiar with quinoa, you should give it a try. It’s considered a super food — a complete protein source, good source of dietary fiber and phosphorus, gluten-free, and considered easy to digest. For only 220 calories for 1 cup, it provides essential amino acids, vitamins and minerals. Quinoa’s versatility makes it ideal for salads, pilafs, porridges, breads, or just about anything else where you’d use a grain. There are all kinds of recipes online, so pick one and try it — I don’t think you’ll be disappointed! I should know better than to read your blog at night! Dang, I’m hungry! « Welcome to Munchie’s Mind!